Advanced Card Systems Ltd., an Asia Pacific supplier of PC-linked smart card readers, plans to launch its newest offering, an NFC contactless smart card reader token, in the third quarter of this year. 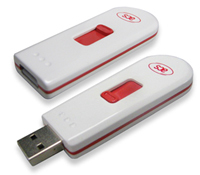 Called the ACR122T, the USB token is designed for mobile applications. Its compact USB plug design makes it portable and easy to use. According to the company, it is suitable for a wide range of NFC applications, such as secure computer log-on with corresponding contactless cards or NFC tags in public places like a coffee shop or a public library, balance-checking and reloading of an e-purse or for online payment. The ACR122T supports various types of contactless cards, including ISO 14443 Type A and B, Mifare and FeliCa cards and NFC contactless tags.